When Magritte debuted this in 1929, people were not that amused. A picture of a pipe with the words “Ceci n’est pas un pipe” (“This is not a pipe”) under it had most folks saying what you may be thinking: um, yes it is! His point was that even if paintings are representational, they are only a symbol of the thing they represent. This may seem obvious, but it’s pretty clever way to address the semiotic gap between the visual and the verbal, and makes you think twice about the relationship we have with images. In true Surrealist fashion, Magritte is questioning the terms of reality we mostly take for granted. A picture of a thing is…not that thing! We make the connection ourselves, and Magritte and his dream-obsessed homies were attempting to disrupt that process, or at least make us more aware of how it works. In order to do that, René Magritte made some weird art. Maybe he was smoking something stronger than tobacco in his infamous pipe? The Treachery of Images (French: La Trahison des images) is a painting by surrealist painter René Magritte. It is also known as This is Not a Pipe and The Wind and the Song. Magritte painted it when he was 30 years old. It is on display at the Los Angeles County Museum of Art. The painting shows a pipe. Below it, Magritte painted, "Ceci n'est pas une pipe. ", French for "This is not a pipe." The theme of pipes with the text "Ceci n'est pas une pipe" is extended in Les Mots et Les Images,La Clé des Songes,Ceci n'est pas une pipe (L'air et la chanson),The Tune and Also the Words,Ceci n’est pas une pomme, and Les Deux Mystères. The painting is sometimes given as an example of meta message conveyed by paralanguage. Compare with Korzybski's ""The word is not the thing" and "The map is not the territory" as well as Diderot's This is not a story. On December 15, 1929, Paul Eluard and Andre Breton published an essay about poetry in the publication La Revolution Surrealiste (the Surrealist Revolution) as a reaction to the publication by poet Paul Valéry « Notes sur la poésie » in Les Nouvelles littéraires of September 28,1929. When Paul Valery wrote "Poetry is a survival", Breton and Éluard made fun of it and wrote : « Poetry is a pipe », as a referral to the painting of Magritte. In the same edition of La Revolution Surrealiste, Magritte publishes 1.« Les mots et les images », his founding text illustrated where words play with images. 2. his answer to the survey on love ; 3. his painting Je ne vois pas la [femme] cachée dans la forêt, a painting tableau surrounded by photos of sixteen surrealists with their eyes closed, including René Magritte himself. 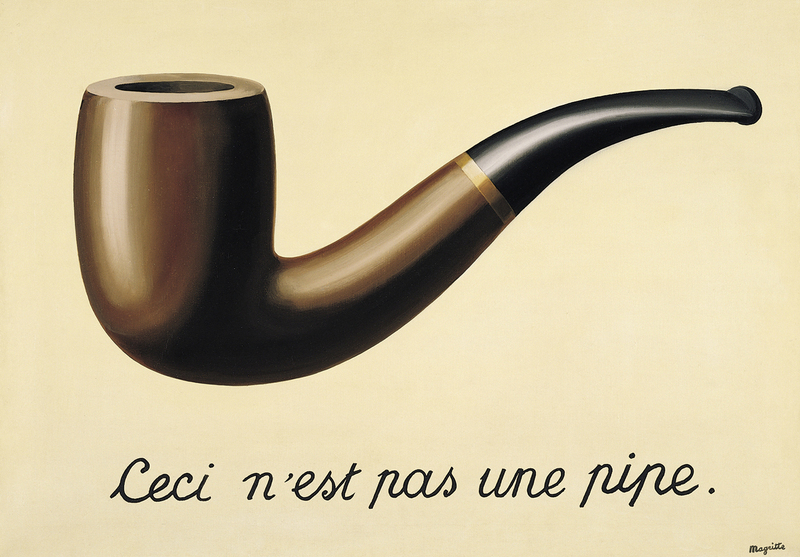 Check out the full Wikipedia article about The Treachery of Images.